After barely getting by the Carolina Panthers last week, the Arizona Cardinals defense could not hold on to an eight point lead in the fourth quarter against the Washington Redskins at FedEx Field on Sunday. Game two against the Redskins saw more of what we saw from the Cardinals in week one, with just a different result in the end. The offense moved the ball pretty well, and had a couple of big plays. The defense still looked confused at times and could not stop the opposition when they needed. With the Arizona Cardinals having a soft schedule to begin this NFL season, they needed to get off to a good start. Unfortunately, they are now 1-1 on the season after losing 21-22 against the Redskins. In reality, both teams made their share of mistakes in the game, but the Redskins dominated the game in total yards and time of possession from the initial kickoff. If it wasn’t for the mistakes by the Redskins, this game would have been over early on. The Redskins drove the ball 70 yards to the Cardinal six yard line on their first possession of the game. Rex Grossman overthrew Santana Moss and the pass was intercepted by Adrian Wilson on the Cardinals two yard line. On the Redskins next possession, they drove the ball 42 yards until a tipped pass by Anthony Armstrong was intercepted by Richard Marshall of the Cardinals. 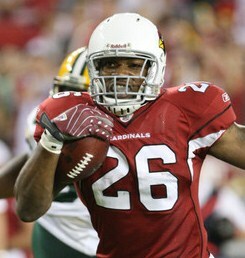 This time, the Cardinals capitalized on the interception when Kevin Kolb hit tight end Jeff King for a 21 yard touchdown. By the end of the first quarter, the Redskins had gained 139 yards, taking 12:33 off the clock, but trailed 7-0. The second quarter saw more of the same dominance by the Redskins. They continued their drive that ended the first quarter, and got down to the Cardinal three yard line. A false start on third and three made the Redskins settle for a field goal. The Redskins drove the ball 80 yards on their next possession to score their first touchdown of the game, while the Cardinal offense sputtered. A blocked field goal by Calais Campbell stopped another scoring opportunity by the Redskins just before halftime. The Redskins had the ball inside the Cardinals ten yard line three times, and another possession at the Cardinal twelve, but came up with only two scores, and a 10-7 halftime lead. The Cardinals finally had a sustained drive in the third quarter, and after nine plays and 90 yards, regained the lead with a two yard touchdown run by Beanie Wells. The Cardinals were mixing up the run and pass much better than in the first half, where they only ran the ball three times. If it wasn’t for a sack and an interception earlier in the quarter, the Cardinals may have put at least another three on the board as they had the ball first and ten on the Redskins 16 yard line. With the two long drives by the Cardinals, the Redskins only had possession twice in the third quarter and found themselves down 14-10. A field goal by the Redskins on their first possession of the fourth quarter narrowed the lead to 14-13. On the first play from their own 27, Cardinals quarterback Kevin Kolb hit Larry Fitzgerald on a deep sideline route. Fitzgerald got behind the coverage and took the pass 73 yards for a touchdown. The Redskins came right back with their own touchdown as the Cardinals defense could not stop them. Rex Grossman led a 13 play 73 yard drive that ended with an 18 yard touchdown pass to Santana Moss. After a missed two point conversion attempt, the Cardinals had a slight lead 21-19. The Cardinals went three and out in their next possession, and the Redskins drove the ball 48 yards to the Cardinal 16, before settling for a game leading field goal with 1:50 left in the game. The Cardinals had plenty of time to move the ball within field goal range to win the game. On their first play from scrimmage after the kickoff, Kolb hit Chansi Stuckey for a 12 yard completion, but Byron Westbrook knocked the ball loose and it was recovered by Reed Doughty of the Redskins. The Redskins just ran down the clock until they had to punt. By then the clock was at zero and the Redskins had won 22-21. The Cardinals defense has now given up 932 yards in two games as the Redskins amassed a total of 455 yards on the day. After allowing rookie Cam Newton to pass for an NFL record 422 yards last week, Rex Grossman was 25 of 43 and threw for 291 yards on Sunday. The Redskins rushed for another 172 yards behind leading rusher and former Cardinal Tim Hightower, who had 96 yards on the day. For a defense that promises to get after the offense, they only came up with one sack on Grossman. 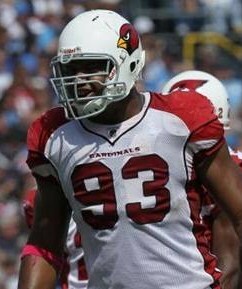 The Cardinals are suffering some growing pains as they try to learn the new Ray Horton defense. Starting two inexperienced corners has not helped the situation. They continue to miss assignments and blow coverages in the backfield. If it wasn’t for a few miscues by the Redskins offense, this game would not have been as close as it ended up. If the Cardinals don’t fix the defense soon, it could end up being another 5-11 season. The Cardinals offense continues to make strides, although the first half saw them settling for the pass way too often. Kevin Kolb was 17 for 30, passing for 251 yards, two touchdowns and an interception. He was sacked three times, fumbled once, but the ball was recovered by the Cardinals. The offensive line has got to give Kolb more time, and if they do, they can expect even better play from the young quarterback. Receiver Larry Fitzgerald showed why he is the highest paid receiver in the NFL, catching 7 passes for 133 yards and a touchdown on the day. The Cardinals are also utilizing their tight ends more, as Jeff King had his second touchdown catch in as many games. The passing game will only get better as Kolb and the receiving core spend more time together. The running game was effective, even if it was only utilized in the second half. Beanie Wells had 18 carries for 93 yards, and is averaging 5.7 yards per carry on the season. He has scored a touchdown in both games this season, and also has had carries for more than 20 yards in each game. The offensive line has done well run blocking thus far, and that can only benefit the Cardinals in the long run. When it came down to crunch time, the Cardinals could not stop the Redskins as they scored on their first three possessions in the fourth quarter. The Redskins held the ball for almost 40 minutes of the game, which makes it difficult on the Cardinals defense to be on the field so long. It also puts a lot of pressure on the Cardinals offense when they finally do have an opportunity to get on the field. It didn’t help that the Cardinals were penalized 10 times for 97 yards and the Redskins only had 3 penalties for 15 yards. The Cardinals have now lost eight straight games to the Redskins, and have not won on the Redskins home turf since 1998. The Cardinals are currently 29th in total defense, giving up an average of 466 yards per game. They have also given up 393 passing yards per game and are ranked 29th in the NFL. They rank 30th with 13 passing plays of more than 20 yards, and 31st in the NFL allowing three passing plays of more than 40 yards. They are second in offensive penalty yards, collecting 158 in two games. The Cardinals take on the 0-2 Seattle Seahawks in the Seahawks home opener at CenturyLink Field. This will be a divisional game the Cardinals need to win if they expect to make the post-season this year. ~ by Troy Erickson Realtor on September 20, 2011.